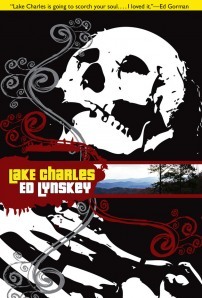 What Carl Hiaasen did for Florida, Ed Lynskey has done for Tennessee in his funny and slick Appalachian noir thriller. Shades of ‘Cutters Bone’ (one of the many underrated Jeff Bridges movies) haunt this tale, the same obsessive, relentless seeking for justice against arrogance and power. Lake Charles is a fetid lake, once a tourist haven and provides an epic setting for this complex tale of murder and disappearance. Sometime just before this novel begins Brendan woke up in a sleazy motel next to a pretty girl to find she was dead. Ashleigh Sizemore died of an overdose of Angel Dust and even though Brendan calls the cops – it’s him they arrested and charged with murder. By sheer luck he’s out on bail thanks to a sympathetic judge and is now camping with his twin sister Edna and her husband, his best buddy, Brendan in the forest beside Lake Charles. It doesn’t help that the dead Ashleigh is still talking to him in his head (blame it on the recreational weed in Brendan’s system). Edna goes missing on the lake. At first Cobb thinks it’s because she’d pissed off with him, but as time goes by they are growing ever more worried and begin to search. Cobb and Brendan meet up with Herzog, Brendan’s lawyer, sitting in a tree. He’s allegedly looking for turkeys, but Brendan has his doubts. When they stumble across fields of weed growing in the woods and Cobb gets an arrow in his chest, Brendan begins to realise his life is in real danger. He calls Mr Kuzawa, Cobb’s dad (ex-Fed, ex Korean War vet). He’s not best pleased to discover his son is dead and the wife most likely abducted. He arrives fully loaded with 12 gauge shotguns and they go looking for Edna with lawyer Herzog reluctantly in tow. The dead Ashleigh keeps making contact. She accuses Brendan of being a wimp, she wants him to solve her murder, but Brendan is aware that he’s up against her rich father who well on his way to becoming the next Senator for Tennessee and getting a fair trial is going to be pretty darn difficult. Brendan and Jerry Kuzawa discover more pot plantations and realise that the dead Ashleigh’s father is connected somehow and take their revenge by uprooting them. Cobb dead, Ashleigh dead, Edna definitely missing, Brendan is beginning to worry he’s going to be spending the rest of his live in jail unless he can find Ashleigh’s killer, let alone find out who took his sister Edna. And just who are the people following them and what are their intentions? And the guys in a red Cadillac with New York plates that keep crossing their paths, what have they got to do with anything? Lake Charles is rich in atmosphere, sharply funny with wonderful authentic dialogue; this is ‘Dude’ fiction at its best and highly recommended. © Hackwriters 1999-2011 all rights reserved - all comments are the writers' own responsibility - no liability accepted by hackwriters.com or affiliates.